Extra thick welded PVC Frame and Sash. Fully braced and covered with protective film, the Integral Buk frame and Window combination along with ICF Adaptor system eliminates the need for additional preparation or finishing, resulting in labor savings. Sloped sill promotes water drainage. Welded corners provide a quality finish and eliminate leaking. 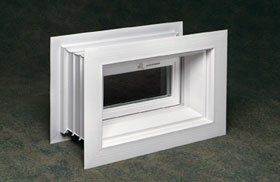 Units are fully weather-stripped to protect against air and water leaks. Glazed with energy efficient 3/4" insulating glass. Energy efficient PVC keeps interior surfaces warmer and reduces condensation and energy costs. Optional low-e glass for improved thermal performance.. Available as Glider, Awning/Hopper or Casement style. Glider is double-slider style and which features sash rollers for ease of operation. Hinged windows feature a friction fit concealed hinge system and lever handle sash latches. All units feature a fiberglass mesh full screen. Available in numerous standard sizes and wall thicknesses to accommodate most ICF wall systems. Several egress sizes and styles are available.